The project became too much . 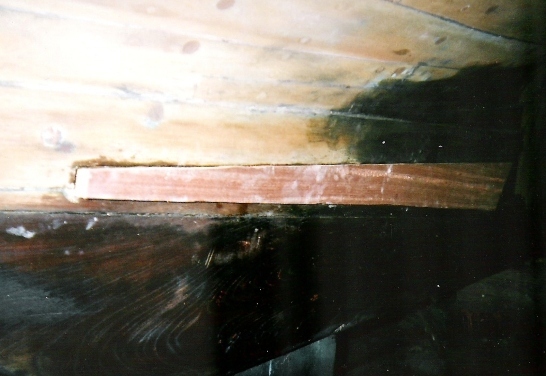 The whole keelson was rotten as well as the frames. I moved and gave the boat away to a friend and it was broken down soon after. Hey, my name is Chris Johnson and I live in Guilford Connecticut. I have KALOKE. I have currently removed all systems, including engine, interior and much more. The project has definitely snow balled. I am currently removing broken frames and possibly planks. 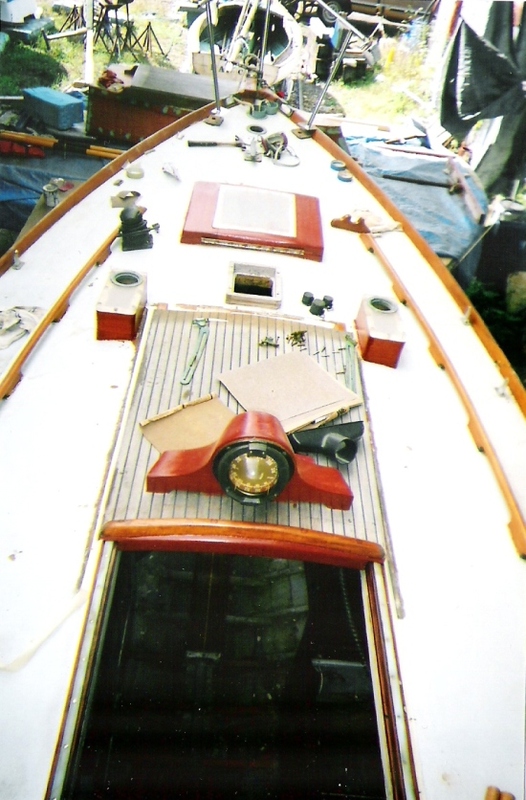 I have removed the transom planking and am in the process of refastening the planks to the frame. She's very nice looking but some changes are going to be made. Hopefully people will understand the reasons. Here we insert a bit of history. KALOKE's previous owner, Kerry Lange, started KALOKE's restoration and gave us a wonderful story about this boat, details of which are told below. The project got to be too much and Kerry started to look for the right person who could continue. Kerry found that person and on September 15, 2010 sent in a couple of emails. Here they are consolidated and edited. "The Deal is Done" Kaloke was trucked out of Pine Creek Boatyard around 5:30 p.m. yesterday. She was trucked to the new owner's family's home in Guilford, CT just off Rt. 1 near the Guilford/Madison line. I did give him your contact information and asked him keep in touch with you. 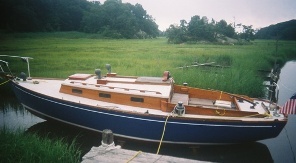 He is qualified to see the restoration through to the finish, a graduate of one of the wood boat schools in Maine, and works now as a shipswright. 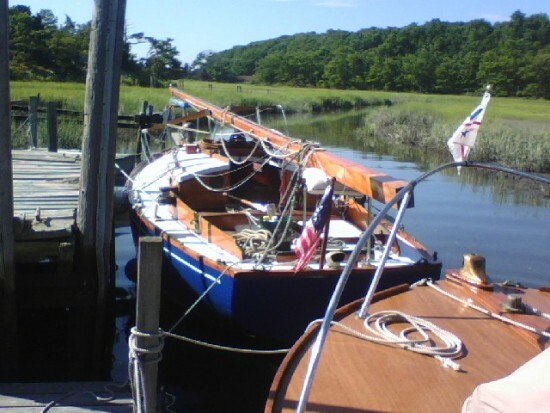 When Kaloke is complete and in the water sailing, he intends on keeping her in Stony Creek on a mooring!!!!!! Again I take my hat off to you for all the help you"ve given on behalf of Kaloke and me!!! I got an email from Washington State from someone who read about Kaloke on the web!!! They were looking into trucking her across country!!! I"m glad she's local and I can continue to watch from a distance!! Thanks, Kerry, for this great story and all your effort to keep KALOKE with us. OK, back on track. 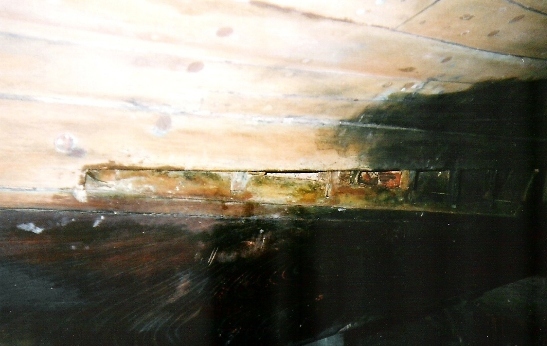 Chris is a professional but even professionals are not immune to that disease that seems to infect all boat owners - projects that "snowball". 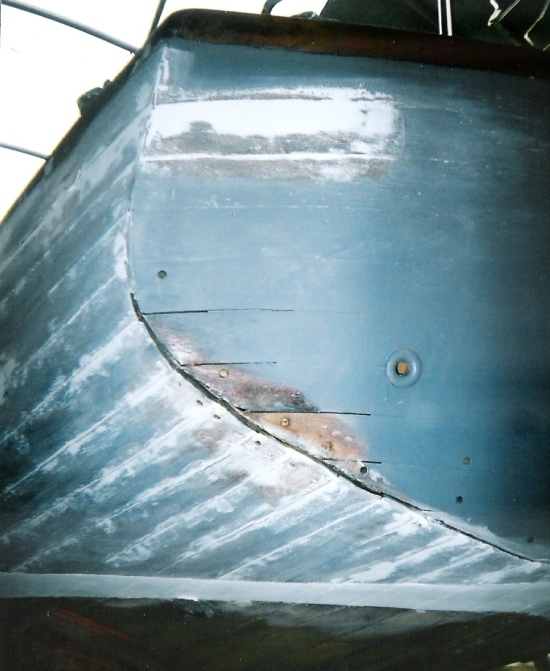 Most of us with fiberglass hulls are always in awe of wooden boat maintenance and restoration. As her 'before' picture above shows KALOKE is a beauty. 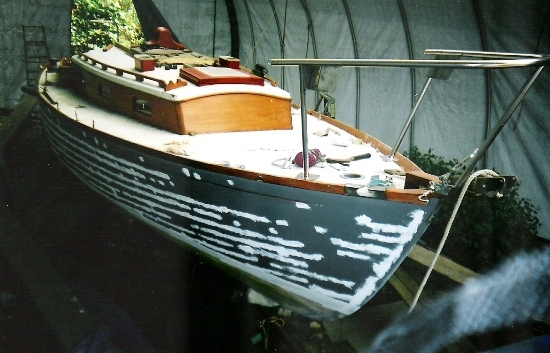 But particularly in wood boats, beauty has got to continue beneath the skin. She and Chris are really getting to know each other. The following pictures are descriptive. Thankfully, this end did not need a second photo! Webmaster Note: We noted above that KALOKE is the only Mermaid 24 we know. Not true, technically. 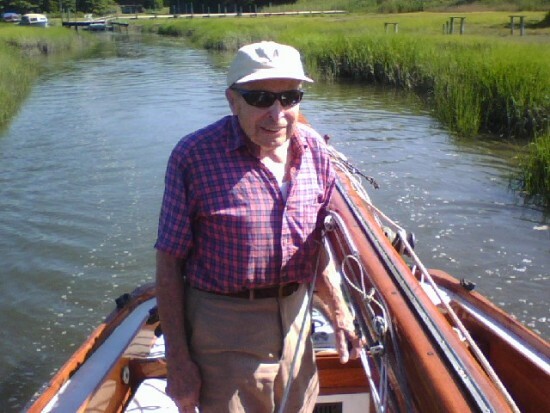 We know that John Shumaker, the founder of Yankee Yachts (click to go there), and builder of 175 Dolphins, bought a set of Mermaid 24 plans from S&S in 1962 and started to build a boat with a partner. 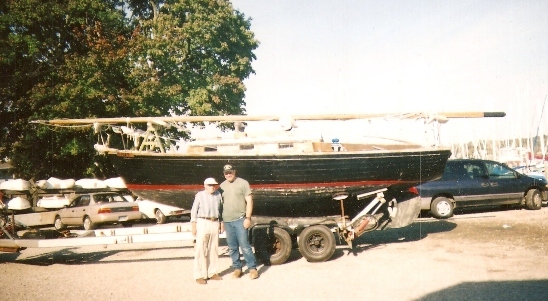 He subsequently decided to buy a bare fiberglass hull from O'Day, #71, and built a wood boat on it, presumably leaving his partner to finish the Mermaid. We are actively trying to find this boat - stay tuned. KALOKE is a wooden Dolphin built in Japan. S&S called these boats Mermaid 24's. She was built to S&S plans # 1497-S. More information on this design can be obtained by clicking here. 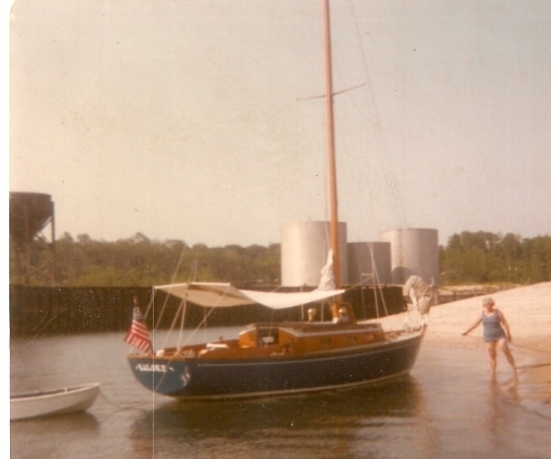 Kerry Lange took a few minutes off from his sanding to send us some pictures of KALOKE as she was 35 years ago before his father, Walt, sold her, and as she was found in Mystic, CT in the Fall of 2006 - when Kerry bought her back! 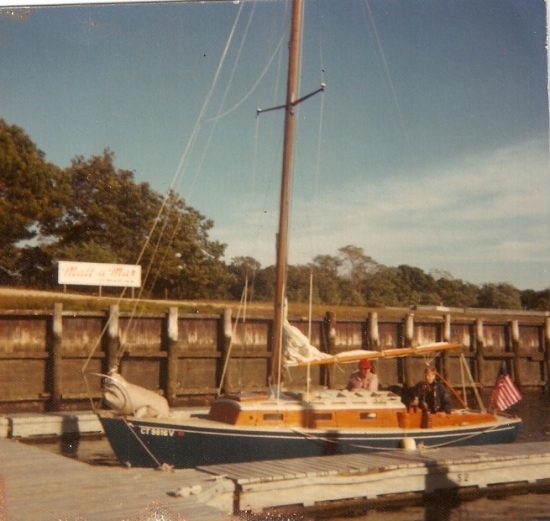 Here is Walt and KALOKE in 1973 ready for launch on the ways at Pine Island Marina, a small tidal marina in Stony Creek where they wintered the boat. 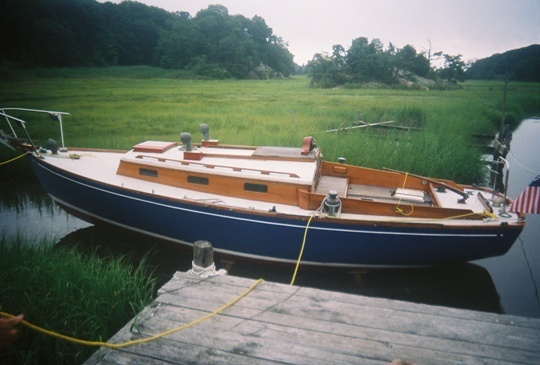 He kept her on a mooring inside the Thimble Islands. KALOKE's name comes from the first two initials of the Lange kids' names - KAren, LOri, and KErry. Walt bought Kaloke in the middle 1960's from an American who got her as a gift for helping a Japanese company land a ship building contract in the US. August 29, 2010 Kerry has come to a point in his restoration of KaLoKe where he has had to make a tough decision. We have had an exchange of emails over the past 30 days and here they are (combined and edited). This is a rare opportunity for the right person. We towed KaLoKe down the creek to the trolley bridge, I stepped her mast and towed her out to her mooring. Now mind you she had been soaking in the creek for a good week or so with no major leaking. After getting all my helpers ashore including dear dad at the ripe age of 92!!! I rowed back out to tidy things up only to find the floorboards floating!!!! She was leaking badly, to the point where I thought she might sink. In a panic I called my helpers all back towed her back to the bridge, now with the tide dropping, my son scampered up the bridge once again set the block'n tackle and we pulled out the mast and made a run up the creek before the tide got too low!!! Now that she is dockside in the creek the leaking once again has stopped. It tells me that she is very loose and no doubt needs complete re=fasting, the down pressure of the mast andn shrouds opened her up, I think. After several days KaLoKe is still in the water in the tidal creek at the boatyard, leaking is slow, but there, mostly around the floor timbers near the mast step. I am writing to you because my dad and I feel there is no one else to talk to about this. 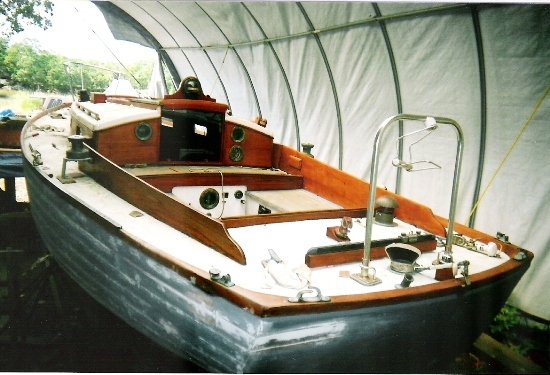 I have a chance of buying a Fiberglass Ted Hermann Lazy Jack schooner 32' at a very good price!!! However, what to do with KaLoKe?? We both feel good about offering her as a gift. She could be easily towed down the Sound while she's in the water. I will no doubt haul her after Labor Day before the rush of floats and boats come up the creek. I want someone to finish what I"ve started. If all else fails my thoughts turn toward donating her to a boat building school. I"d rather see a Dolphin 24 lover have her. Let me know what your thoughts are. She is so close to the finish line, but yet so much more needs to be done. I"m burning out and missing my cruising and sailing days some badly. I have posted KaLoKe on Craig's List, I will NOT give her to just anyone, they must show me they are sincere in finishing what I have started. Please could you post this on the website - that she is available to the right person?? She"s in the water and ready to be towed to her new home. This is the a very special boat, custom built in Japan in 1961, following Sparkman and Stevens plans of "The Dolphin 24" If you go to www.Dolphin 24.org/restorations_karoke you will see pictures and progress, and a story behind this special boat. 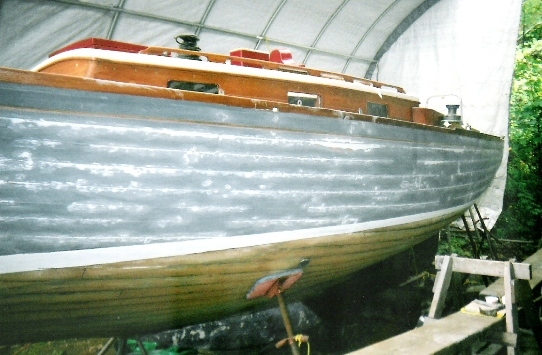 She is presently in the water ready to be towed to her new home. 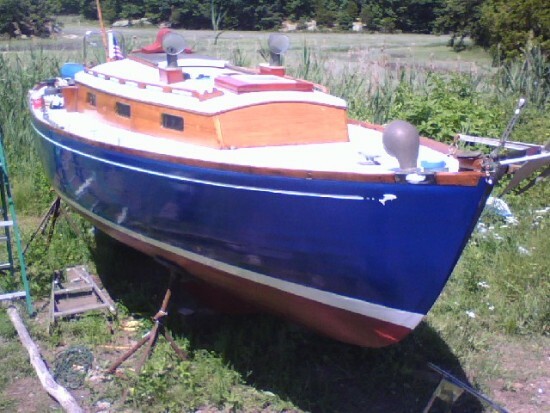 I have been restoring her for 4 years and now have her floating, however much more needs to be done, and I have an opportunity to buy a bigger boat and get back to sailing. I will not give this boat away to just anyone!! You must show willingness to finish off this classic and sail her like she used to be sailed!! She is FREE to the right person!! Kerry is working on KALOKE's story but this is what we have now. 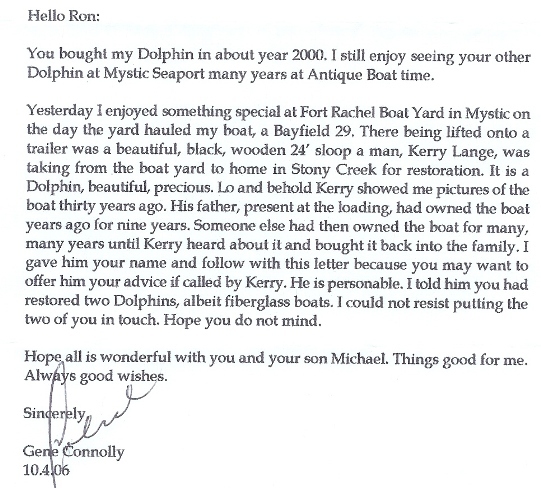 In the Fall of 2006 Kerry heard of a black wood "Dolphin" for sale in Mystic, CT. On a whim he and his father drove up to take a look at her. 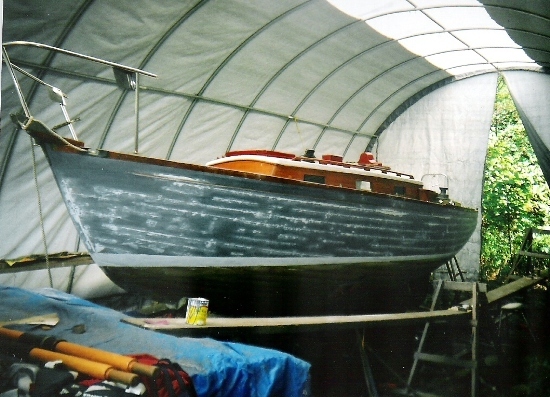 Their old boat had a blue hull, and looking carefully, they could see this boat was originally blue! 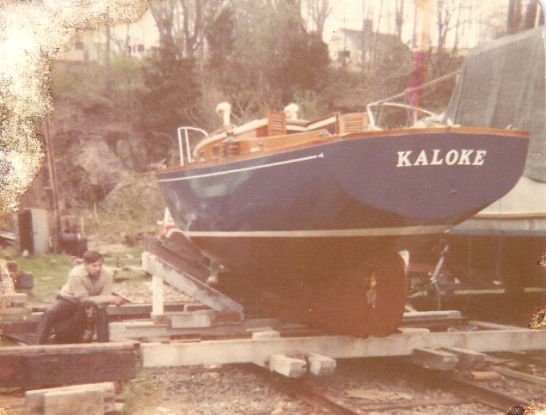 The short story is now KALOKE back in Stony Creek with Kerry hard at work restoring her. Below, in the quonset hut, is KALOKE's 'new' home while she undergoes her restoration. You can just see the same railway she used 30+ years ago to get to her water. 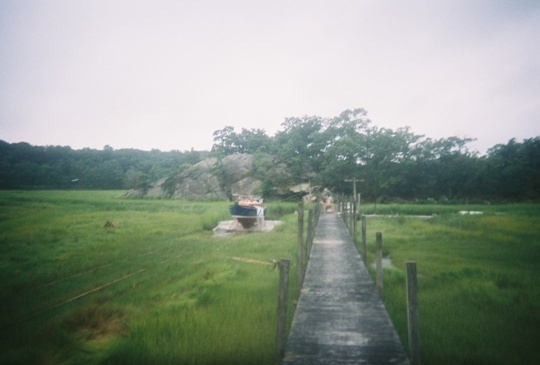 The next 2 pictures are KALOKE at Mattituck on Long Island's north shore. Kerry sent in the following pictures of the work in progress. She already looks beautiful! Beautiful compass housing - Where to put it? KALOKE-Update: Bottom hss been seam-compounded, topsides are back to blue, white boottop, red bottom. Still in the tent, cabin is still a mess. I"m glad I kept picking away at her. 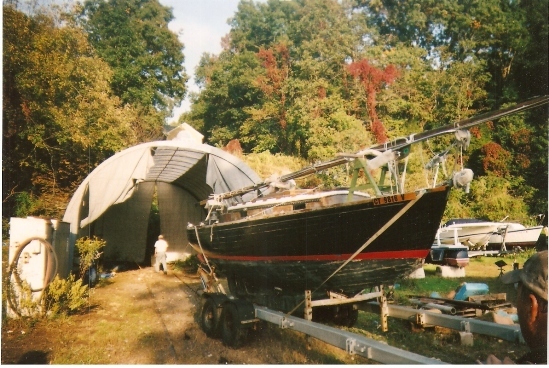 I may even launch her and just let her soak and swell dockside for the summer right in the creek. It's a tidal creek but it's only soft mud she'll be in at low tide. She is starting to look like the photos of her from the '70's!! Finally launched last Sunday. She is leaking more than I thought she would. 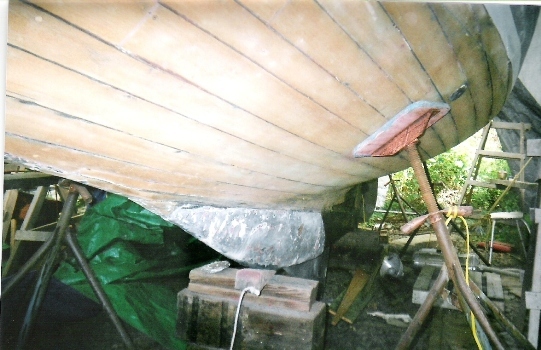 Mostly around where the keel - centerboard trunk meet. Trunk is stainless steel. I should have run new caulking in this area. Trying to address the the trouble spots with "Slick Seam" a water proof putty like material. Enclosed were 20+ pictures on a cd that are an incredible record of a hard job well done. Kaloke has been out of the water 8 years! To accomodate those pictures we have set up a special page called Kaloke's Launch, August 2, 2009 which you can see by clicking the link below. Here are a few teasers to get us started. A really great picture! Kaloke afloat in her same tidal creek she called home some 40 years ago. 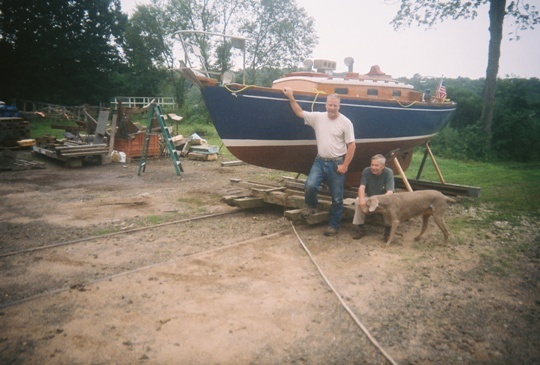 What it took to get her here is the stuff of great restoration stories, that only Kerry really knows, and only those of us who have restored boats can begin to appreciate. Kaloke is a wood Dolphin, with a wood hull, another dimension. Kaloke on that old marine railway ready to go - with her team. Kerry father must have had a special feeling at this moment with his old boat ready once again on the ways. We need that 3rd crew's name... Lucy!!! Kaloke at the end of the long railway through the grass down to the creek. Her mast will get stepped on the seaward side of the low RR bridge. This scene is a long way from the usual marina with its travel lift placing most of our boats in their element. For more pictures about this launch click here. 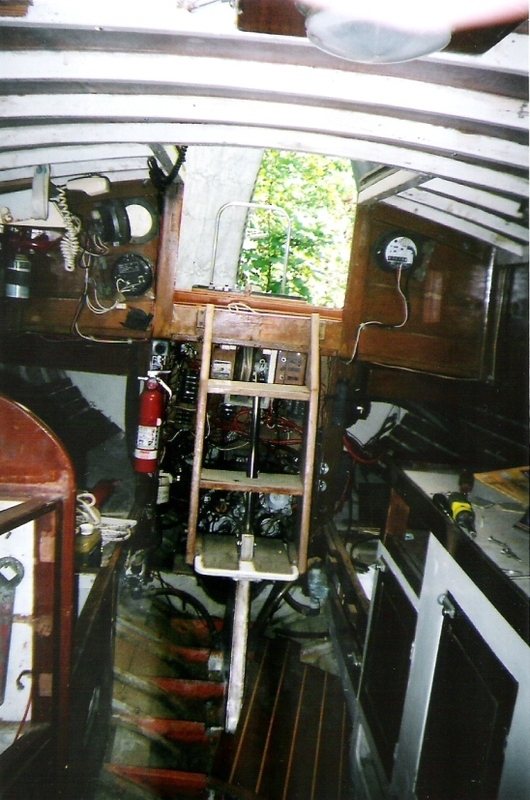 Last week we towed Kaloke down the creek to the trolley bridge, I stepped her mast and towed her out to her mooring. Now mind you she had been soaking in the creek for a good week or so with no major leaking. After getting all my helpers ashore including dear dad at the ripe age of 92!!! I rowed back out to tidy things up only to find the floorboards floating!!!! She was leaking badly, to the point where I thought she may sink. In a panic I called my helpers all back towed her back to the bridge, now with the tide dropping my son scampered up the bridge once again set the block 'n tackle and we pulled out the mast and made a run up the creek before the tide got too low!!! But, at this point I will no doubt keep picking away at making Kaloke right. It is just such a set back, I thought I might be sailing her this August, instead I think I have to re-fasten the entire bottom!!! I really dread doing it. I am really missing being out there sailing and cruising. As far as interior pictures, nothing has changed since the last set I gave you that you posted - it's still a work in progress down there. We did fire off the Yamar Diesel engine after 9 years of sitting!!! Gave it some throttle and blew a oil line!!! Shot oil all over the cabin, good oil pressure anyways..... lol. If anyone wants to get involved, or see her, put my e-mail out there. I"ll take skilled help at this point. 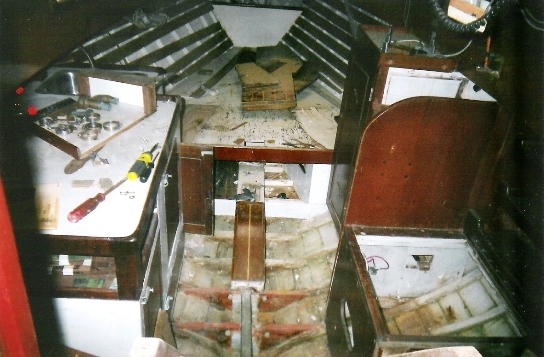 I feel I have to re-fasten all the screws in the planking to the ribs - mainly the garboard and floor timbers area. I used Gulvit this year and coated the entire bottom with it - it"s a waterproof epoxy kind of like West System. Needless to say, that was a "Short-Cut", the real answer is refastening, I'm afraid. I sent some pictures your way of the trip down the creek. I got too busy at the bridge to take any. Ready to launch, July, 2010 - I'd say she's worth saving! !